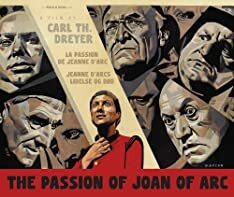 One of the most emotional film experiences of any era, Carl Theodor Dreyer's 1928 The Passion of Joan of Arc is a miracle of the cinema, an enigmatic and profoundly moving work that merges the worlds of the viewer and of saintly Joan herself into one shared experience of hushed delirium. Dreyer's film charts the final days of Joan of Arc as she undergoes the debasement that accompanies her trial for charges of heresy – through her imprisonment and execution at the stake. The portrayal of Joan by Renée Maria Falconetti is frequently heralded as the all-time finest performance in the history of film, and Dreyer's unusual and virtuosic method, in seeming to render the very soul of his actress, vaulted the director decisively into the ranks of the art form's supreme geniuses. 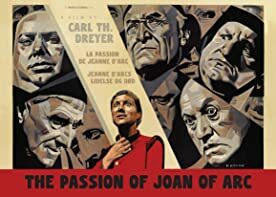 The Masters of Cinema Series is proud to present The Passion of Joan of Arc in its worldwide Blu-ray première, in an exclusive new restoration, presented in both 20fps and 24fps playback speeds, and featuring Dreyer's own original Danish-language intertitles. • The complete "Lo Duca" version of the film – the version (featuring an alternate edit and soundtrack) that circulated in France and around the world for decades before the rediscovery of Dreyer's "director's cut"
• A 100-PAGE BOOK containing: Writing on the film by Jean Drum & Dale D. Drum about the film, replete with extensive quotations from Dreyer, Falconetti, and more; a contemporary review of the film by H.D. (the poet Hilda Doolittle); a new English translation of the 1930 review of the film by Luis Buñuel; a short 1951 excerpt about the film from writing by André Bazin; a new translation of the 1953 essay about the film by Chris Marker; two short pieces about the film and cinema in general by Carl Theodor Dreyer from 1929 and 1950; a new essay by scholar Casper Tybjerg unpacking the version history of the film; a selection of the production's set-design blueprints, photographs of physical set-models, and onset stills, all reprinted in high-resolution courtesy of the Danish Film Institute; a detailed technical note on the MoC restoration, versions presented, and frame-rates presented; and rare and archival imagery. Last edited by swo17 on Wed Feb 29, 2012 12:44 pm, edited 1 time in total. Wow, that's a big get. I wonder if MoC will beat Criterion out of the gate on the blu of this. With the Criterion re-release being imminent, I'll have to compare specs and such before choosing. Just to clarify. We'll be working on Dreyer's LA PASSION DE JEANNE D'ARC all year. It will *not* be released this Spring. Looking like 2013. Wow! I really cannot wait for this! Presumably the contents isn't finalised yet so I'm going to suggest that, as an extra, Falconetti's previous work would be nice to see. Apparently both Le Clown and Le Comtesse de Sommerive both survive at the Cinematheque Francaise. I know that Le Clown is a short, I'm not sure about Sommerive. Who knows what condition they're in though! I don't think My Metier has been released in the UK either. Calvin wrote: I don't think My Metier has been released in the UK either. It's on the BFI's Master of the House disc. Fingers crossed for both versions, and it'll be interesting to see what musical accompaniment(s) will be on offer. Einhorn's Voices of Light is a must but I'd like to see In the Nursery's score get stuck on there. I've only seen the movie with the Einhorn score, and liked it so much I went out and bought the soundtrack. From what I understand the majority of the movie's fans dislike that particular score though. For that reason I'm curious to check out the movie with another score (is there a particular one most of you prefer? ), but I do hope Einhorn isn't ditched from the upcoming blu-ray. Nick said on Twitter they are in talks to get the Adrian Utley & Will Gregory score. We put the Utley & Gregory soundtrack on live at Alexandra Palace with an orchestra last summer with the film playing behind them and it was amaaaazing. jamie_atp wrote: We put the Utley & Gregory soundtrack on live at Alexandra Palace with an orchestra last summer with the film playing behind them and it was amaaaazing. It was indeed amazing, except when anyone left the room, you were subjected to a massive wall of noise from The Swans playing next door. Yes agreed, we're looking into sorting out the soundclash problems for this year. Or you could ask Swans to provide the score? zedz wrote: Fingers crossed for both versions, and it'll be interesting to see what musical accompaniment(s) will be on offer. I'd be hoping for the Uttley/Gregory score too but which would probably make the In the Nursery redundant or a luxury. I'm also more of a fan of Carlo Crivelli's score commissioned a few years ago which is spikier than the Einhorn. More Bartok than Holy Minimalist. It will depend I suppose on what versions are offered up as to the suitability/availability of scores. Which brings into question what master/source is being used? Apparently it isn't the Gaumont prospective restoration that still isn't 100% certain. The more scores the better, in my opinion. Similarly, someone needs to put out Man with a Movie Camera with at least like five different options for scores (Alloy, Nyman, ITN, Biosphere, Cinematic Orchestra, etc.). Last edited by swo17 on Wed Jan 25, 2012 6:06 pm, edited 2 times in total. Count me as excited for this release. And I know it's not reality, but I'll 2nd the call for a Swans score to this film. Crazy, I always thought the preferred way to view this film was completely silent? swo17 wrote: The more scores the better, in my opinion. Similarly, someone needs to put out Man with a Movie Camera with at least like five different options for scores (Alloy, Nyman, ITN, Biosphere, Cinematic Orchestra, etc.). Good point. Wonder if Nick Cave and the Dirty three's version was recorded? Peacock wrote: Crazy, I always thought the preferred way to view this film was completely silent? That option will also be included. Royalty costs per unit mean that it's quite prohibitive for the distributor to include more than one score on a release, unless that extra cost is added to the asking price. About a decade ago, Film 4 broadcast it mute - the only time I can recall a silent feature being shown that way on UK TV, though it may have been simply their reluctance to license a score. I transferred an orchestral score that German TV had compiled or commissioned. The Voices of Light score always dissuaded me from buying the Criterion DVD - I find any vocal score for silent films very distracting, especially when there are lots of intertitles. peerpee wrote: Royalty costs per unit mean that it's quite prohibitive for the distributor to include more than one score on a release, unless that extra cost is added to the asking price. All right, I pay 10 GBP more if you include the ITN score.